Planet of Death (or “pod”) has been quite a simple, but captivating racing game from 1997, released by Ubisoft for many platforms. But you’re not here to read another Wikipedia-like paragraph. You’re here because you want to play it online again, after more than 20 years. It is indeed still possible to play Pod online with the help of Hamachi, but the menu screens to set up a game can be quite confusing due to the high number of outdated functionality (who seriously plays over COM ports nowadays?) and misleading UI feedback (disabled buttons are not necessarily grayed out, just not clickable). This guide helps you step by step to set up an internet game in Pod. If you need any real-time guidance, you can join my Pod Discord server. Pod itself, patched to run on your system. Getting specific versions to run on current systems is out of scope for this article. You may want to run it with DxWnd to not crash it when switching to desktop. Any version works, either the original OEM Pod, Pod Gold, the GoG re-release, ran vanilla, with nGlide, or any other wrapper. The game lobby and in-game netcode never changed compatibility-wise (AFAIK). Make sure everyone has the tracks you want to play together. If in doubt, just play the first 16 tracks for now (Beltane – HQ). Hamachi. You remember this little VPN client from years ago? It’s still current, and it’s the easiest way to connect to your other players. Download Hamachi from the link above and start it. Connect or create a network which all participating players have to join. Ensure every player can be pinged and has no warning sign to it’s right. I experienced that the Hamachi setup did not install a virtual network adapter on my Windows 10 machine. If in doubt, check your network connections and ensure you have a “LogMeIn Hamachi Virtual Ethernet Adapter” installed and connected. If it’s missing, follow these steps here to manually add it. What the guide doesn’t tell you is that you have to restart the Hamachi Windows service after installing it, or the errors caused by it won’t go away. After you started Pod, go to Options and set your player name. This may not matter much to you at other times, but for online games, this is the nickname you will have. Then return to the main menu. 1 PC being the host (called “master” by Ubisoft). 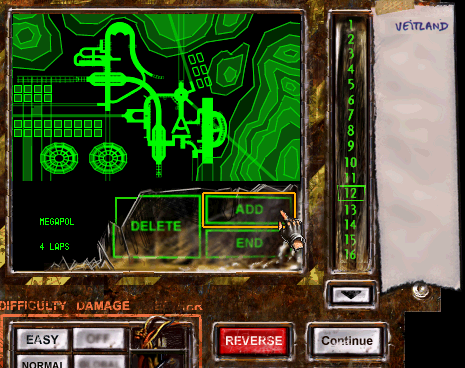 The player being the host gets to set up a game session, in which he selects the game mode and tracks to play. 1 or more PCs being the clients (called “slaves” by Ubisoft). They join the host and a session running on it, and can only ready-up or talk to others, while waiting for the host to start the game. You can see almost everything is striked through there. If you want to know why, the following list is for you, otherwise, just continue to the next paragraph. Split: This is just splitscreen. You can set up a local game on 1 PC with this, and Pod even supports multiple players on one PC participating in an online game with additional opponents. However, that’s an advanced scenario not covered here. This however explains why the button can be toggled on an off, while the others can only be clicked. 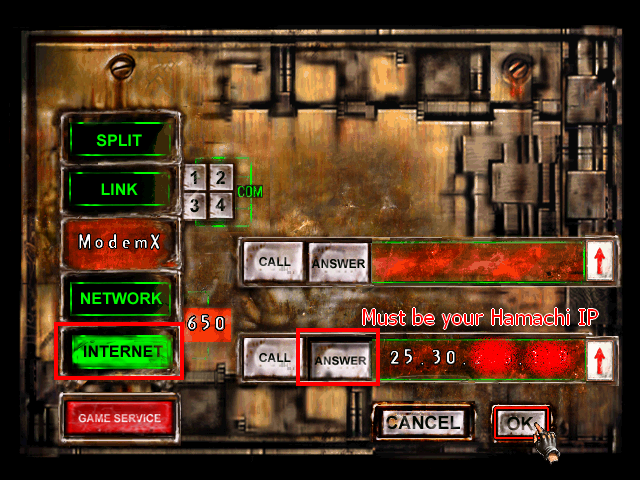 Link: If you want to play a “networked” game over COM on one of the 4 COM ports, this button is for you. Note that the buttons 1-4 are not disabled if the corresponding COM port is not available – they will just not be clickable. Modern systems have only 1 internal COM port anyway, so only 1 will be clickable. ModemX: Play a game over some outdated modem technology you don’t want to know more about. The upper row of call / answer seems dedicated to it. Network: This is a networked game over the outdated IPX/SPX protocol. Internet: This is a TCP/IP based game, which is exactly what you want. Game Service: This button does not exist in very early versions of Pod. The now defunct Game Service allowed easy matchmaking by letting players join a Pod server hosted over at Ubisoft France (turned off since long), and see which games are open. The original version transferred data completely unencrypted over standard TCP/IP (including registration data and passwords, nice! ), while a later, patchable version applied a relatively simple encryption on the data, making it incompatible with older versions. There have been fan projects to create a private server to revive this, but are unfinished as of writing this article. Also, there’s an “Up / Down” button to the right side of the both bars. You want to ignore it. It seems to act like a very confusing clipboard to store IP addresses. Really, don’t click it. It messes with your brain and has no meaningful function whatsoever. So, click the Internet button. Notice that a 650 will appear in the orange field to the right of it, this is the port over which communication will happen. Just leave it as is. The following steps depend on wether you want to be the master or slave. You don’t typically get to choose this at bedtime, so enjoy your freedom here, and communicate it with the participants! Ensure you’ve clicked the Internet button. Since the master has to answer to connecting players, click the Answer button. Now, your Hamachi IP should appear in the lower bar. If it is not your Hamachi IP, make sure you set up Hamachi correctly (s. above). Welcome to the session screen, in which you have to Add a new session. Then you can enter any name for it which will appear to others, and press Enter or click the input field again. There apparently is support for multiple sessions on one machine, but it’s not meaningful nowadays. Single: Only a single track will be raced on. Chpship: A championship consists of multiple tracks in either default or random order, or picked by you. Duel: This teams up players of the same colors (finally car colors have a meaning! ), adding their scores together. This mode can be combined with the other two. Normal: Only enabled with Chpship. In case you selected Custom or one of the Random features before, this will return to sequential track order, and allows players to choose the car they play. Random / Random Tracks / Random Both / Random Cars: Only enabled with Chpship. As soon as you click this button, you’ll experience the first and third button changing, aswell as a brain-fart. Tracks: Randomizes the tracks which will be placed in the championship. Both: Randomizes both the tracks and the cars each player will drive. Cars: Randomizes only the cars each player will drive. Tracks will stay sequential. Custom: Only enabled with Chpship. Clicking it allows you to select a custom order of tracks to play in the championship. Also allows players to pick their car again. Points / Time: Decides how players win the competition. Either they add up points according to the placement at the end of the race, or the total driven time decides the final placement. This is the only button enabled with “Single” even though it barely makes sense there. 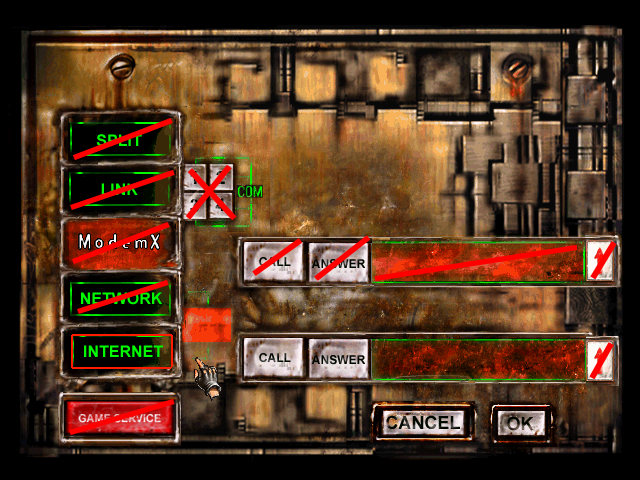 Wait Time (bottom left): With the + / – buttons, you can set up the number of seconds here the game will wait on other players to configure their car, reach the finish, or accept the results screen (while this looks like the volume “slider” from the options menu, it has more to do with lazy UI resource reuse rather than sound output). State: Every player needs to be ready before the master can start the game. The master always has an M here as he is logically always ready (he can click it to make it a red X, but I have no idea what it’s supposed to mean). The participants have to click the empty rectangle left to them to make it green, signalling their ready state. 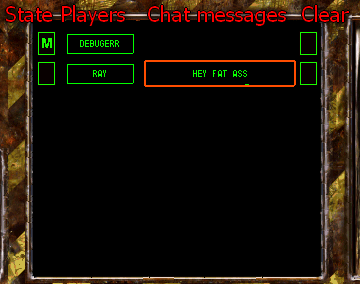 Player name: A rectangle displaying the name each player set up in the Options screen before. Click a name to private message only that player. Clear chat button: To make the dated chat experience less awkward, you can completely clear your last message with the rectangle on the right side of the list, instead of deleting the message by hand. 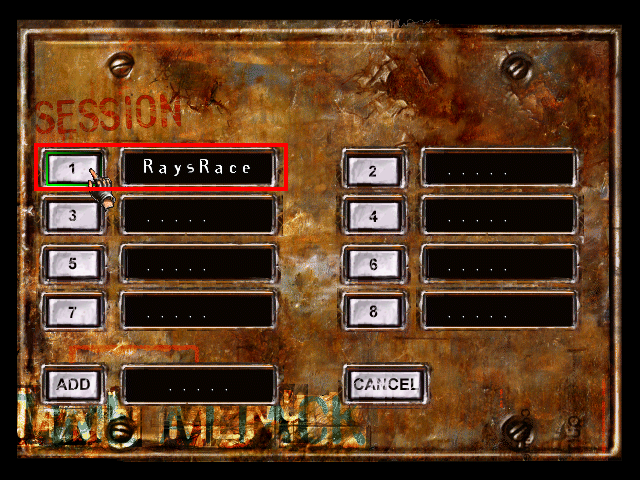 Game mode: You can configure at what difficulty and with which damage model a race will take place, similar to the Options menu. Luckily, disabled buttons for uncombinable configurations are blurred here for once (the third column was never active and is just decoration, and it’s up to you to guess what the title above it would’ve said). 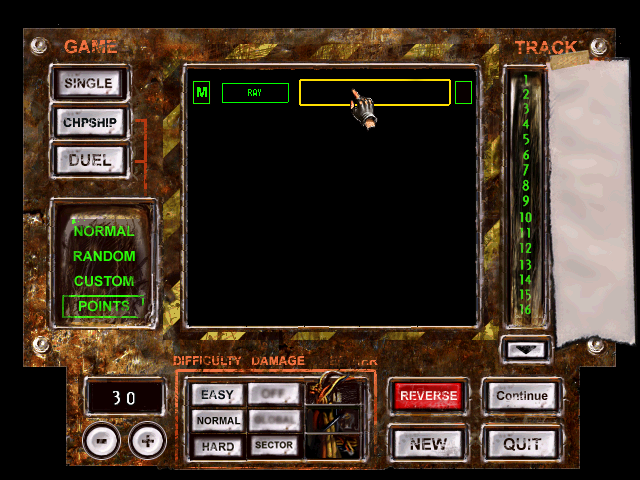 Track list (right): Here you see numbers 1-16 representing a track page as known from the Singleplayer screen. Clicking a number will replace the player list with a track preview, and the option to add the track to the list or remove it. Delete: In case the track is already on the list to the right, it will be removed from it. Add: Adds the track to the list. Ensure to hit Reverse in case you want to drive it backwards first. End: Returns back to the player list (does not move the track to the last position of the list). Arrow below numbers: This switches to the next page of tracks you have installed, if you have more than 16 installed. No indicator other than clicking the numbers and seeing which track appears tells you on which page you are. Note that the order of the installed custom tracks does not matter when wanting to play it online, as tracks have internal IDs with which they are synced to other players. Continue: You can only click this button if all players are ready, to get to the car selection for everyone and start the game. New: Not sure what it does. Either it clears the track list completely or restarts a championship scoring. Ensure you clicked the Internet button, after which “Internet IP” appears to the right side of it. Enter the IP of the master here (which is the Hamachi IP of him, as it appeared when he clicked “Answer”). After entering the IP, click Call. Some recent IPs will appear at the top, but you better ignore this “clipboard” abomination. No matter if the connection was successful or not (this is the tricky thing), you’ll end up in the Session screen. After a few seconds (not more than 5), the name of a session the master created will appear at one of the number rows above, and you want to click the corresponding button to join it. If no session appears, the master is either not answering (the connection failed) or has not created a session yet. As soon as every player greenlits his ready state and the master clicked Continue, you’ll suddenly be in the car selection screen. When the master continued to the car selection screen and everyone picked their car or the wait time ran out, the race will start with a slight delay. For players ready before others, “Waiting for players” will keep flashing above the loading screen. Cars tend to teleport around a bit (even AI cars), this is normal even with the best connections and the fault of Pod’s dated net code. Cheats do not work, entering them does nothing. It would’ve been nice to use the LABEL or MAP+F9 cheat at least. The current wait timer can be seen in different places. In the stats screen, it’s at the top left. © Syroot. All rights reserved.